Whether you’re a tourist in the Big Apple or you just want to relax with your coworkers after a day’s work in Manhattan, this 2-hour happy hour cruise of New York Harbor is the perfect way to unwind. 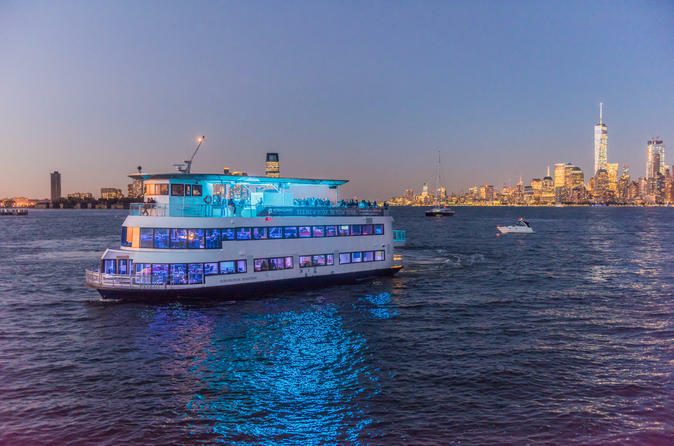 Kick back with music, drinks and dancing aboard a sightseeing yacht that takes you past Manhattan's iconic skyline, crowned by the Empire State Building. Depending on which option you select, your cruise will can be accompanied by beer and wine or choose drinks from the premium open bar. In the evening, make your way to Pier 15 along Manhattan’s South Street Seaport at the East River Esplanade, and board the yacht for your 2-hour happy hour cruise. As the boat departs down the East River, admire the dusky glow of New York Harbor and snap photos of Lower Manhattan's postcard-perfect skyline as it lights up. Mingle with friends, family or co-workers as you sip beer and wine or order up your favorite cocktails from the premium open bar (depending on which option you select upon booking). Listen to live music or DJ entertainment and let loose on the dance floor, or perch on the outer decks for panoramic views of New York City landmarks such as the Empire State Building, the Freedom Tower, the Chrysler Building and the Brooklyn Bridge. Conclude your happy hour cruise back at Pier 15.